I think of cauliflower as a highly inoffensive vegetable. (Update: J takes offense at this description. He wants me to describe it as “a PERFECT vegetable.” Anyway.) It’s mildly flavored when cooked, and it’s not green. You can hide it in mac and cheese if you’re so inclined (or so I hear). Even avowed vegetable-haters should find nothing offensive about its sweet flavor or tender texture when roasted. And yet…my kids won’t touch it. This recipe, which is for the grown-ups, hides nothing. In fact, it makes a whole head of cauliflower the proud center of a serving plate. It takes a while to cook but no time to prepare, which makes it a perfect side dish when company’s coming (we had it with The Best Red Lentil Soup of 2012 tonight). Just a few things to keep in mind: try to core your cauliflower carefully, so that the entire head remains intact (I did not succeed at this). And if you’re like me, you’ll want to tear the leaves of the cauliflower into bite-sized pieces, toss them with a bit of the oil and spice mixture, and roast them alongside the cauliflower until they are beautifully crisp. Cauliflower chips! This entry was posted in Asian Flavors, Easily Multiplies to Feed a Crowd, Food, Recipes, Vegan or Would-Be-Just-As-Good-Vegan, Vegetables By Themselves and tagged Cauliflower, CSA recipes, Indian spices, Nash's CSA, Roasted cauliflower, Vegetables everyone should like on July 29, 2012 by emmycooks. We did roasted cauliflower tonight, but yes, you can definitely hide it in mac and cheese! Oh, Seattle. 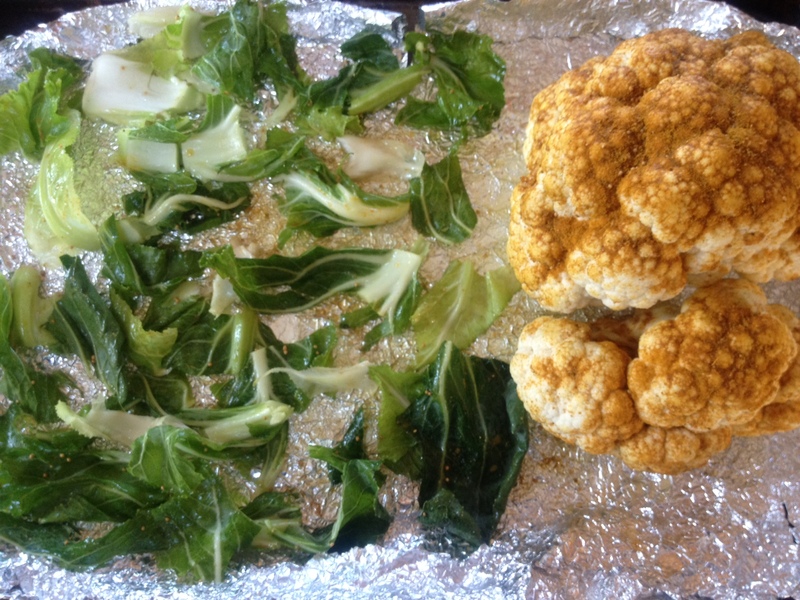 Mid-summer and we’re both roasting cauliflower! And we recently packed both fleece and down jackets for a trip out to the Olympics–and wore them both! It’s because we both like vegetables. :) That’s why your recipes always look great to me too! I am so going to buy a cauliflower today! Thanks for the inspiration! We eat roasted cauliflower but this is taking it to a whole new level! Funny, we never do cauliflower with cheese sauce–although I do love it in soup with cheddar. Maybe that will be the trick! I didnt know you could roast cauliflower whole! This looks bloody brilliant. I actually do like cauliflower anyway so this might not mean as much, but really do love that extra pinch of spices. Makes me want to go get some cauliflower in Indian spices this instant! Ummmm, yum! My kids are also not fans of the wonders of cauliflower – at least not consistently. I WILL try this for us though. Looks great! Too bad for them–more for us! This is really the only attitude to have with the little turkeys – you don’t like it? That’s good because I REALLY want some more. I can’t figure out why my husband and kids don’t love cauliflower, what would be more delicious? I want to eat that photo. Those “chips” are inspired. And the rest of it looks great, too! They were so good. I had to hide the plate to save some for J–even the kids like the chips! I had to laugh at your update! I started writing a response the other day, but got distracted … one of the things I was going to say was that “highly inoffensive” wasn’t exactly high praise! 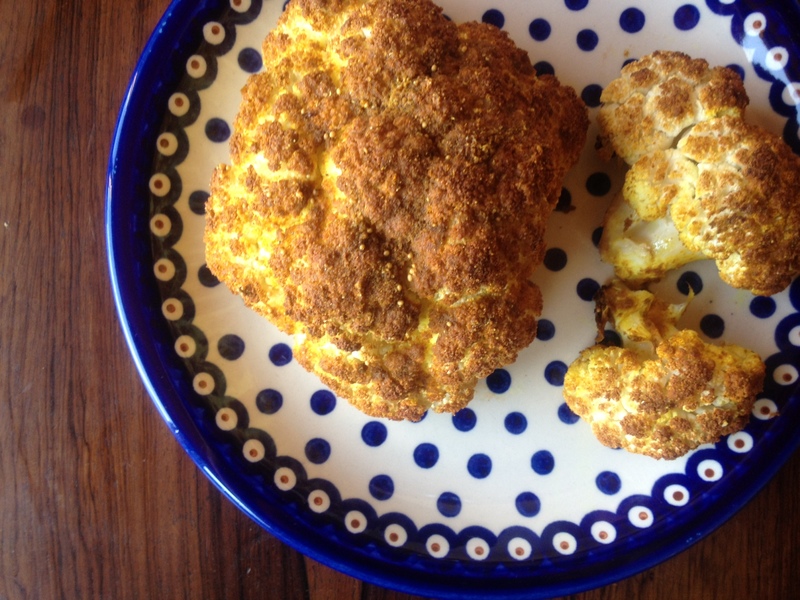 I’m very fond of cauliflower, and sometimes roast it with olive oil, cumin and pepper. I’m definitely going to try some Indian spices next time! I tried this tonight, my first recipe taste from your blog (although I’ve been following for awhile, just haven’t had time to cook!). It was soo good! I just wish the whole thing was crispy like the outside was. I might have to cut and roast next time to get more crunchiness, but it was delicious!!! Thank you!